Dear Saint Bernadette, Chosen by Almighty God as a channel of His Graces and Blessings, and through your humble obedience to the requests of Our Blessed Mother, Mary, you gained for us the Miraculous waters of Spiritual and physical healing.We implore you to listen to our pleading prayers that we may be healed of our Spiritual and physical imperfections. Help, O Dear Saint Bernadette to follow your example, so that irrespective of our own pain and suffering we may always be mindful of the needs of others, especially those whose sufferings are greater than ours. As we await the Mercy of God, remind us to offer up our pain and suffering for the conversion of sinners, and in reparation for the sins and blasphemies of mankind. 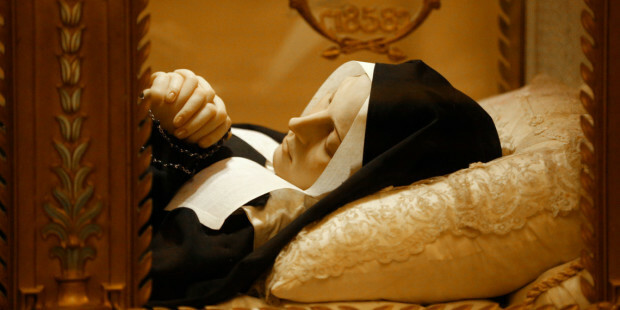 Pray for Saint Bernadette, that like you, we may always be obedient to the will of Our Heavenly Father, and that through our prayers and humility we may bring consolation to the Most Sacred Heart of Jesus and the Immaculate Heart of Mary that have been so grievously wounded by our sins. Holy Saint Bernadette of Lourdes, Pray for us.